For buyers looking for a powerful vehicle with off-road capability, plenty of cargo room, and an interior and exterior style that’s stylish and comfortable, then a used Jeep Commander for sale is a great place to start. Manufactured from 2005-2010, you’ll find only one generation of the used Jeep Commander for sale in your area. The Jeep Commander is lauded for its spacious seating - seating up to seven people with three rows - and for that iconic, rugged style that the Jeep brand is famously known for. With a number of off-road capabilities, a variety of trims, and a powerful chassis and powertrain enabling it to handle any terrain or activity, the Jeep Commander is a great vehicle for adventure enthusiasts and weekend warriors. If you’re looking for a car that can handle a large roof rack, can hold all of your gear, and can withstand the toughest landscapes, then a Jeep Commander is a great place to start. This four-door SUV is one of the largest vehicles that Jeep has to offer, and has a distinctive rectangular hood and powerful frame that makes it instantly recognizable on the road. Whether you’re looking to enhance your weekend adventure or simply have a spacious and reliable SUV for you and your passengers, the used Jeep Commander won’t disappoint. From the desert to the beach, a used Jeep Commander is a vehicle you can rely on to get you anywhere. The 2006 Jeep Commander has the most safety features of any Jeep vehicle before it, with technologies like stability control, anti-lock brakes, and an onboard security system. With stability control technology, off-roading became a safer and more efficient driving experience for those looking for efficient handling and the best safety technologies. This vehicle was also made for off-road conditions and is a great car for those looking to navigate tough landscapes like mountain roads and desert terrain. The 2006 Jeep Commander also comes in two different trims: the Commander and the Commander Limited. The base model comes standard with 4WD, and a 3.7L SOHC V6 engine, delivering 220 horsepower and 235 lb-ft of torque. For those looking for a little more power, the Jeep Commander Limited comes with an impressive 5.7L Hemi V8 engine, delivering 330 hp and 375 lb-ft of torque. With safety and power, this is a vehicle that promises the best performance with the safest results. The interior of the 2006 Jeep Commander doesn’t disappoint either, including some high-tech technologies like dual climate zones so all passengers can control their temperatures and air, 8-way power driver seats, power sunroof, available leather bucket seats, available full map GPS display, available rear-seat entertainment, a liftgate with remote control, and tire pressure monitoring to name just a few of the incredible extra features this vehicle has to offer. With entertainment options, plenty of space, and powerful capability, this is a car to get excited about. The manufacturers introduced a number of updates to the 2007 Jeep Commander, improving an already pretty impressive vehicle. Proving popular for families who wanted to buy a large-sized vehicle without it being a typical minivan or SUV, the Jeep Commander manufacturer’s wanted to add some extra comfort and entertainment features for those who had kids to entertain on long car rides. For families looking for lots of interior space for camping gear and kids, as well as the ability to have off-road capability with interior perks like an entertainment system, then this is the best used car for you. Focusing on the interior and exterior features to improve the qualities already popular with its buyers, Jeep introduced the ultra-luxury Jeep Commander Overlander trim, which was equipped with platinum-chrome exterior accents, and wood, leather, and suede interior for a more sophisticated and comfortable cabin. In addition, as far as technology features, Jeep stepped up their game with new features like a rearview camera, a remote starter, power liftgate, and glass roof panels. As far as the powertrain, 2WD was also introduced, and the base model of the previous year was renamed the Jeep Commander Sport to emphasize the car’s excellent off-road capabilities. Perfecting an already high-class model, the 2007 Jeep Commander was popular with families and adventurers everywhere. The 2008 Jeep Commander also received a number of updates - refining the previous years model and including more entertainment and powertrain options. The 2008 Jeep Commander replaced the previous base model engine with a 4.7L V8 engine, gaining 70 horsepower to land at a powerful 305 hp, while also still maintaining optimal fuel efficiency. With a powerful engine for all trims, the 2008 Jeep Commander is great for those looking to haul or tow small trailers or boats to their vacation destinations. In addition, for those looking for a smaller sized version of the used Jeep Commander for sale, this 2008 model was made available with a 5-passenger cabin, making it a smaller vehicle for those looking for a little less space and more versatility. Finally, the 2008 model also received new entertainment features like the Sirius Backseat TV and Jeep’s MyGig, which can hold up to 20-gigabytes of space for songs, pictures, and navigation. Additionally, in order to improve on some of the safety features, this vehicle also received safety updates such as Hill Start Assist, which holds the brake momentarily when you’re on a hill so the vehicle doesn’t roll backwards, as well as hill descent control, and an available trailer sway control to help stabilize your trailer while towing. 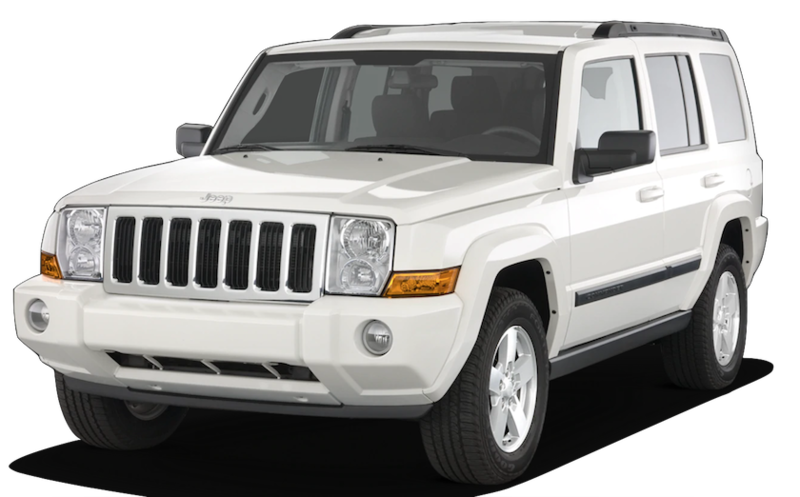 With a number of new technological, cosmetic, and safety updates, the 2008 Jeep Commander may be the best model yet. The 2009 Jeep Commander received some minor updates on an already great model. These updates included upgraded torque and horsepower for the 5.7L Hemi V8 engine, gaining 27 horsepower and 14 lb-ft of torque. This allowed the upper-level trims to tow a maximum of 7,400 lbs and the base model to tow a maximum of 6,500 lbs. With the towing capacity of some current trucks now on the market, this used Jeep Commander for sale is a great, multi-use vehicle that can handle a lot of cargo, people, and towing. Focusing on some of the vehicle’s interior features, the 2009 model saw upgrades to its entertainment options, including a new 9-inch rear seat DVD screen to keep kids and family occupied as well as an iPod interface to integrate your iPod with the car radio so you can play all of your favorite music at any time. In addition, the manufacturer’s of the 2009 Jeep Commander updated the previous Entertainment System to the current UConnect system that includes an impressive 30 gigabytes of hard drive. With more tech features, this car is great for tech-savvy adventurers looking to escape to the outdoors, while still retaining their favorite background music and apps. The 2010 Jeep Commander was rated a 4.6 out of 5 by Cars.com and received a few minor updates from the previous years already impressive model. The 2010 Jeep Commander dropped the 4.7L engine to supply every trim with the more powerful 5.7L Hemi V8 engine that delivered 357 hp. This model also received other upgrades including driveline traction control for superior performance and stability, a rear-wheel drive type, and ParkSense parking assist. Proven to be great family and off road vehicle, the used Jeep Commander is a great for those looking to step up for their adventure skills and really get out into the wild with a car that can really get you there. Test Drive The Jeep Commander at McCluskey Auto Today! If we’ve piqued your interest in a used Jeep Commander for sale, then come give your favorite model a test drive today! At McCluskey Auto, we pride ourselves on our excellent customer service, as well as our extensive vehicle knowledge, and expansive history. We have all the Carfax and vehicle histories of any used models, and guarantee with our CPO models that our used cars will be like-new. And while you’re shopping for your used Jeep Commander for sale with McCluskey Auto you can look forward to transparent and a haggle-free car-buying experience. As your local used car dealership we strive to make purchasing a car as convenient, enjoyable, and rewarding as possible - and that means fair and easy-to-understand pricing! At McCluskey Auto, we’re proud to be one of the best dealerships in the region and whether you’re looking for vehicle service, to trade-in your current vehicle, or to just take a look around our lot then you’ve come to the right place. Our friendly and knowledgeable staff will get to know your requirements and budget and make sure we are working for you. At McCluskey Auto the customer is our priority, and we make sure of that by providing you with best experience possible. So what are you waiting for? Come to McCluskey Auto today to test drive your favorite vehicle!